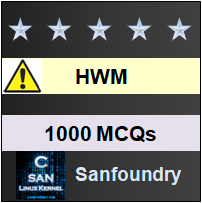 This set of Hazardous Waste Management Multiple Choice Questions & Answers (MCQs) focuses on “Dose Response Relationship”. 1. 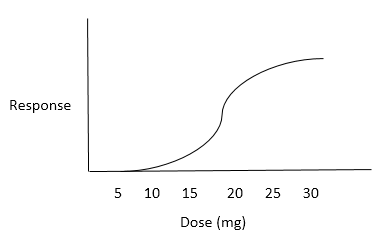 According to the graph, greater the dose more _____ the response. 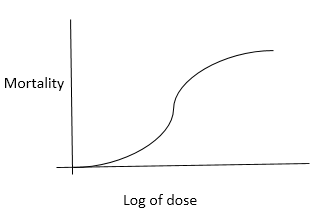 Explanation: Greater the dose, the more severe the response is i.e. greater the number of chemical-receptor complex, the more severe response. Explanation: The toxic effects depends on dose and susceptibility of the exposed individual. 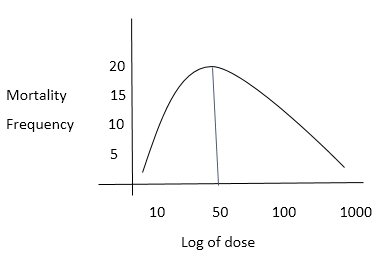 Explanation: Peak dose is observed to be 50 and the mortality frequency is more in the concentrated dose. 4. According to the graph, low death is observed at low concentration. True or False. Explanation: The exposed population will experience no deaths at low dose, few deaths as dose increases and more death at higher dose. 5. What is the first step in development of dose-response relationship curve? 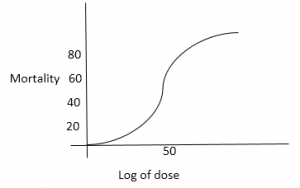 Explanation: The first step in development of dose-response relationship curve is selecting toxicological end point which is caused by exposure to selected chemical. Explanation: The toxicological end point for dose-response relationship should be clear, definitive and directly measurable such as death. 7. Doses are expressed on a _____ basis. Explanation: Reporting on a body size basis allows extrapolation from small test animals to humans. Explanation: The susceptibility of an individual is a function of age, diet, health, status, genetics and exposure to agents. Explanation: Major application of dose-response curve is to obtain threshold level and the relative toxicity of chemicals. Explanation: NOEL is the No observed effect level, which is the highest tested dose of a substance that has reported to have no adverse effect on a population. 11. 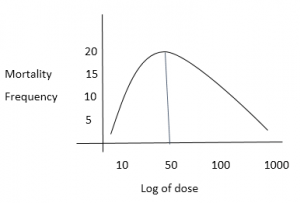 Which of the following dose is NOAEL according to the curve? 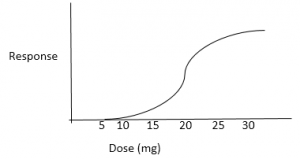 Explanation: The dose 15 mg is considered as no observed adverse effect level on a population. The curve peaks after 17mg, where the effect on a population is observed. 12. 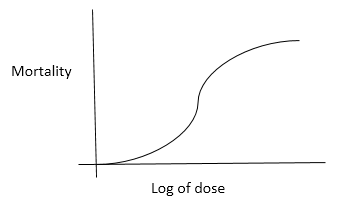 Which of the following dose is LOAEL according to the curve? 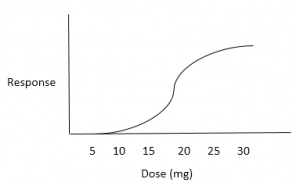 Explanation: At dose 20mg, it is observed that the threshold dose has lowest observed adverse effect level.